(Editor’s introduction: “The Sharing Project” already appeared in this blog with its first manifestation, “To Restore Happyville.” It’s a proteiform project, a body of work that will be presented in the end as both a sculptural video installation and a feature film. Obviously, not in this blog anymore. I publish here its still configuration: 7 episodes each made with one text and one image. It’s hard for me to share my video equipment or to let anyone into my studio. I tell myself that I would face all kinds of problems if anyone damaged my gear, and that I need peace and solitude in order to work effectively. Yet, my rationalizations leave me feeling guilty. I sense that I’m not acting generously enough, and I worry about what my behavior is teaching my kids. One day, my son Zeke, crying profusely, banged on my door, and demanded to know why I wouldn’t share my space with him. I didn’t have a good answer. Then, Zeke showed me his secret hiding spots and offered to share them with me. He argued that there was plenty of room in his “office” for my tools and that I didn’t need another space for them. Zeke’s generosity overwhelmed me, but I wasn’t able to accept his offer. Safeguarding my personal possessions in my own space was too important to me. As I tried to justify my feelings, I thought about John Locke’s claim that we should have the freedom to acquire our own land and wealth and that it shouldn’t bother anyone – unless we do so excessively, or during times of scarcity. Unfortunately, we seem to have forgotten about Locke’s restrictions, and we’ve created a tremendous amount of inequity in the process. While a few of us enjoy excessive amounts of wealth, far too many of us struggle with scarcely enough – if anything – to eat. Gene Nichol; who runs the Center on Poverty, Work, and Opportunity at the University of North Carolina; tells me that 18% of North Carolinians live in poverty and that there are higher levels of poverty in the United States than in any of the other wealthy Western Democracies. As I eat dinner with my wife and our two young boys in our home in Winston-Salem, I think about how there might be more childhood hunger in our city than anywhere else in our country. How can we allow that horrific reality to occur in such a wealthy place? I was wrestling with that dilemma when I went to the Moral March in Raleigh last February. It was a big protest, maybe the biggest in the South since 1965 and perhaps the biggest in North Carolina history. I saw buses from Tennessee, Virginia, and elsewhere. There was a giant traffic jam, as buses filled with activists tried to park. Everyone on our bus was feeling antsy. They knew that there was a lot at stake, and they wanted to be a part of it. I had taken Zeke to smaller protests in Winston-Salem, and I wanted him to experience the March in Raleigh and hear why people were protesting; but it just seemed too dangerous. Too many people had been arrested – including some people I knew – in previous Moral Monday events, and I couldn’t justify putting our young son in danger. The crowd was large, and it was loud. Zeke would have been impressed, and he would have enjoyed seeing all of the signs. They were inventive, and they expressed people’s thoughts about a plethora of things, from the torture we’ve done in Guantanamo Bay to the wars we’ve waged overseas; but mostly the signs and chants reflected what’s happening in North Carolina right now. North Carolina has a high unemployment rate. People need help, but we’ve decided to eliminate significant social safety nets that are essential for those who can’t find jobs. We’ve decided to cut unemployment benefits and reduce the number of weeks of eligibility. We’ve declined expanded federal funds for unemployment benefits and for Medicaid. Reverend Barber insists that the laws that we have passed are immoral. He talks about how we cannot be silent and how we must insist on change. We were all hoping for change at the Moral March, but it hasn’t occurred yet. So, we will gather in Raleigh to march again. Joel Tauber is an artist and filmmaker who is developing the video art program at Wake Forest University. His current undertaking – “The Sharing Project” – will be presented as both a sculptural video installation and a feature film. 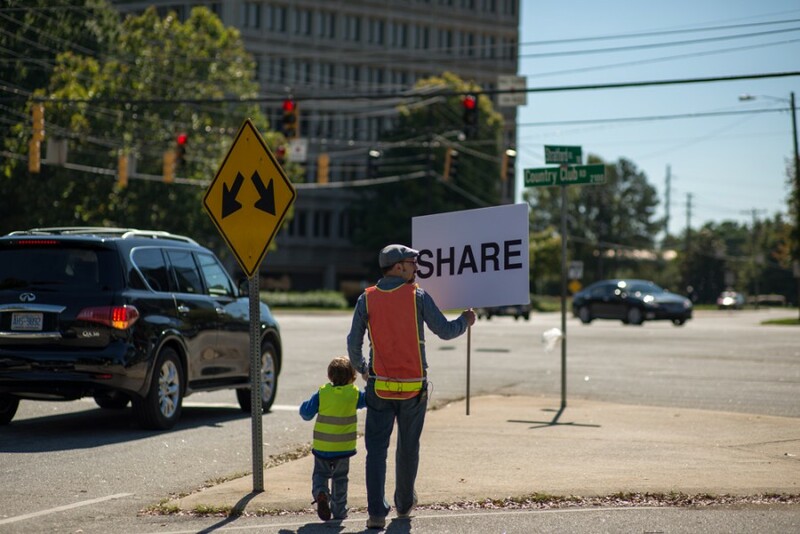 I’ve been struggling for the last couple of years to understand the concept of sharing and how to teach it to our young son Zeke. We have a lot of questions. Why should we share? When should we share? How much should we share? Are we acting consistently? If sharing is a value that we should all embrace, then why is there so much poverty in our very rich country? As we’ve been wrestling with these questions, I’ve been talking to experts in philosophy, evolutionary biology, psychology, history, anthropology, economics, politics, and education. A conversation with the anthropologist David Graeber is one of the many that continues to resonate. He described how the Nuer in South Sudan share food and other necessities freely with members of their camp, but they never share their cattle with each other. Indeed, they will literally defend their cattle with their lives. I was thinking about the Nuer and my conversation with David when Zeke invited his friend, Zev, over for a play-date. At the time, Zeke’s prized possession was his guitar. Zev wanted to play with it, and Zeke, quite reasonably, refused. I asked Zeke to share his guitar, even though I had made it clear to both Zeke and Zev that I was not willing to share the camera that I was using to film them. Indeed, I would not even let them touch the camera, fearing that they might damage it. Zeke, probably sensing my inconsistency, clung to his guitar as if his life depended on it. Zev grabbed it too, and they spun around the room. Eventually, Zeke relented. Zeke and Zev took turns playing the guitar, and they both seemed happy. It was beautiful, but I was left feeling like a hypocrite. Why should Zeke share his most special possession when I was not willing to do the same thing? I want to be a good man, an ethical and generous person, but I also want to make sure that our family is comfortable. I want my wife Alison and our sons Zeke and Ozzie to have easy and happy lives. How do I balance those two quite different desires? This is not an easy question, especially if Darwin’s theory of multi-level selection is correct, as Alex Rosenberg and others now believe. Group selection encourages us to share and behave altruistically, so that we will be part of stronger groups; while individual selection encourages us to behave selfishly, so that we can advance within those groups. We are fundamentally conflicted on a genetic level. We have impulses to both share and to not share. I feel this conflict in myself, and I sense it in Zeke as well. Zeke loves his tools. They’re part of his identity, as a “worker man.” When Ozzie started crawling and messing with his stuff, Zeke responded by hiding his tools in secret compartments to safeguard them. A big part of him clearly does not want to share his special tools. They are too intertwined with his identity. But, Zeke also loves building things with Ozzie, and he is often willing to share even his most special tools with him so they can complete their projects. Christian Miller talked to me about how philosophy may not be able to tell us precisely how much we should share. There are too many ethical theories, and they all may be flawed in some way. At the same time, all of the models – or at least the dominant ones adopted by Western Civilization – suggest that we aren’t sharing or giving enough. The notion that we aren’t sharing enough may be the root of the anger driving all of the protests in North Carolina right now. I went to one of the protests with my camera recently, and I talked to Zeke about it afterwards. It proved to be a very confusing conversation, especially because of all of our previous conversations about sharing. How am I supposed to teach Zeke to share when I also have to explain to him that we slashed unemployment and healthcare benefits precisely at a time when there are so many people who are suffering? There were moments in our history when we had a far more expansive view of what should be shared by everyone as part of the public domain. I was thinking about how far we’ve moved from that perspective, when I stumbled upon the forgotten Socialist Jewish commune of Happyville. As a Jewish guy who recently moved from the Big City to the Carolinas, I immediately felt a lot of kinship with the 50 Russian Jews who left New York to start a Socialist commune in South Carolina between 1905 and 1908. And, it seemed quite clear to me that the Happyville pioneers could teach Zeke and I a lot about sharing. While it’s too late to speak to the Happyville settlers, perhaps some of what they discovered about sharing is buried in the traces of their utopian community. 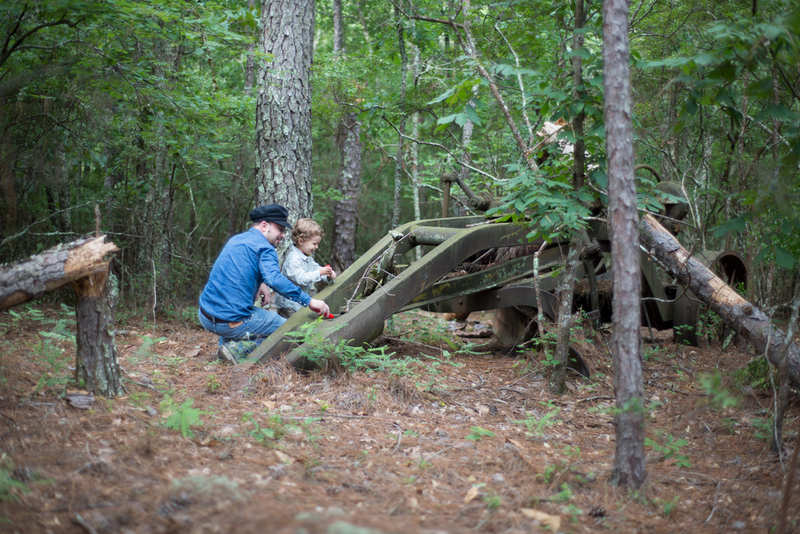 Zeke and I have been exploring the 2200 acre site of Happyville, determined to uncover those mysteries. I’m not sure how much we should be sharing or if we’re capable of living like the Happyville settlers, but I’m saddened that we’re so distant from the forgotten utopian past that it represents. It may be absurd to try to restore Happyville, or even the dream of Happyville, but Zeke and I are trying to do so anyway. Zeke selected his most special tools, and he offered to share them with me. Now, we’re busy in Happyville, working away: probing and digging, prying and tweaking. Joel Tauber: CONDIVIDERE, COSA VUOL DIRE? Mi sono rotto la testa, negli ultimi due anni, per capire cosa vuol dire condividere e insegnarlo a Zeke, il nostro figliolino. Le domande sono tante. Perché dovremmo condividere? Quando? Se condividere è un valore per tutti noi, allora perché c’è tanta miseria nel nostro ricchissimo paese? Lottando con gli interrogativi, ho parlato con esperti di filosofia, biologia evoluzionistica, psicologia, storia, antropologia, economia, politica e educazione. Una conversazione con l’antropologo David Graeber non smette di turbarmi: nella sua descrizione i Nuer del Sudan del Sud condividono liberamente cibo e altri beni necessari con i membri dell’accampamento, ma in nessun caso condividono il bestiame. Anzi, letteralmente difendono il bestiame con la loro stessa vita. Pensavo ai Nuer e alla conversazione con David quando Zeke ha invitato a giocare con lui a casa il suo amico Zev. La chitarra, a quel tempo, era la cosa piu preziosa che Zeke possedeva. Zev voleva giocarci e Zeke, in maniera ragionevole, disse di no. Chiesi a Zeke di condividere la chitarra, benché avessi chiarito a tutti e due Zeke e Zev che non avevo nessuna intenzione di condividere la cinepresa che stavo usando per filmarli. Per paura che potessero rovinarla, non volevo nemmeno che la toccassero. Zeke, forse consapevole della mia incoerenza, si attaccò alla chitarra come se la sua vita dipendesse dallo strumento. Anche Zeb la afferrò, e si rotolarono nella stanza. Alla fine, Zeke mollò. Zeke e Zev suonarono la chitarra a turno, e parevano felici. Bella cosa, ma a me rimase la sensazione dell’ipocrita. Perché mai Zeke avrebbe dovuto condividere il suo gioco più prezioso mentre io non ero disposto a fare lo stesso? Vorrei essere una brava persona, morale e generosa, ma anche vorrei essere sicuro del benessere nella famiglia: vorrei una vita facile e felice per mia moglie Alison e i nostri figli Zeke e Ozzie. Come equilibrare la diversa natura di questi desideri? Non è una domanda facile, specialmente se la teoria darwiniana della selezione a livelli multipli è corretta, come Alex Rosenberg e altri ritengono. La selezione di gruppo ci incoraggia a condividere e ad essere altruisti per rafforzare il gruppo, mentre la selezione individuale ci spinge all’egoismo, e a prevalere nel gruppo. Il conflitto è dentro di noi a livello genetico. Entrambi gli impulsi ci appartengono, condividere e non. Sento il conflitto dentro di me, come lo sento in Zeke. Zeke ama i suoi attrezzi. Fanno parte della sua identità di “lavoratore”. Quando Ozzie cominciò a muoversi carponi e a far confusione con la sua roba, Zeke rispose nascondendo i suoi attrezzi in un posto segreto per salvaguardarli. È chiaro che buona parte di lui non vuole condividere gli attrezzi speciali. Sono troppo intrecciati con la sua identità. Ma a Zeke piace anche fare costruzioni con Ozzie, per cui spesso mette in campo anche i suoi attrezzi più speciali per completare un progetto. Christian Miller mi diceva che la filosofia non ha modo di dirci con precisione quanto dovremmo condividere. Le teorie dell’etica sono troppe, ognuna con qualche difetto. Nello stesso tempo, tutti i modelli di riferimento -almeno quelli adottati dalla civiltà occidentale- suggeriscono che non condividiamo o non diamo abbastanza. La nozione che non condividiamo abbastanza potrebbe essere la radice della rabbia di tutte le proteste nel North Carolina in questo momento. Sono andato di recente a una di queste proteste, con la mia telecamera, e tornato a casa ne ho parlato con Zeke. Specialmente dopo gli scambi verbali precedenti sul problema del condividere, questa conversazione fu molto confusa. Come posso instillare in Zeke il valore del condividere quando devo anche spiegargli il taglio dell’assegno di disoccupazione e dell’assistenza medica proprio mentre ci sono cosi tante persone che patiscono? In altri momenti della nostra storia abbiamo avuto una visione più larga di quanto bene pubblico ciascuno dovrebbe condividere. Pensavo quanto lontani siamo da quella prospettiva quando mi sono imbattuto nella comunità Ebraico-Socialista di Happyville. Da ebreo che si è trasferito da poco dalla Grande Città alle Carolinas, mi sono sentito intimamente vicino ai 50 Ebrei Russi che lasciarono New York per avviare una comunità Socialista nel South Carolina fra il 1905 e il 1908. Ho anche avuto la chiara impressione che i pionieri di Happyville potevano insegnare molto a Zeke e a me sull’importanza di condividere. Mentre è troppo tardi per parlare dei coloni di Happyville, forse qualcuna delle loro scoperte sul condividere è seppellito fra i resti della loro comunità utopistica. Ho esplorato insieme a Zeke i 2200 acri del sito di Happyville, con la determinazione di scoprire quei misteri. Su quanto dovremmo condividere oppure se saremmo capaci di vivere come i coloni di Happyville, non ho nessuna certezza, però mi rattrista che siamo così lontani dal passato utopico, dimenticato, che Happyville rappresentava. Anche se può essere assurdo cercare di restaurare Happyville, o anche il sogno di Happyville, Zeke e io stiamo cercando di farlo lo stesso. Zeke ha scelto i suoi attrezzi più speciali, e mi ha offerto di condividerli con lui. Adesso, abbiamo un sacco di lavoro da fare a Happyville: sondando e scavando, strappando e torcendo.